Curling on the Dartmouth Lakes, Nova Scotia, ca. 1897. Public Domain. The days are getting shorter and colder, areas of Canada have already had the first snowfall of the year, and curling clubs around Canada are gearing up for the season. Curling has been part of Canadian culture for centuries and is still a sport that holds popularity amongst Canadians. The form of curling that exists today has seen substantial changes since the first incarnation of the game in the 16th century. No longer are monstrously heavy bowling ball like stones being thrown down bumpy sheets of outdoor ice. Today’s curlers use circular stones with handles. The earliest circular stones which date from the 1800s were still quite heavy, often weighing over 70 pounds. In Canada the early circular iron curling stones are believed to have been made from metal-rimmed hubcaps from gun-carriages or from melted down cannonballs. This form of iron stone is something that only existed in Canada with many other countries using granite or whinestone for the first circular stones. Today, the curling stones in Canadian curling clubs are made of granite and weigh 40 pounds. Curling was brought to Canada by Scottish immigrants and the first curling club in Canada opened in Montreal in 1807. In the following years clubs opened in Halifax, Quebec City, Toronto, and on numerous military bases. The earliest accounts of curling games are often connected with Canadian forces and local police forces and often regimental officers were key in the formation of the first curling clubs. Curling was considered good for morale, fitness, and as an acceptable form of socialization within a regiment. By the mid 1890s curling had taken hold in many communities across Canada with popularity being strongest in Western Canada. 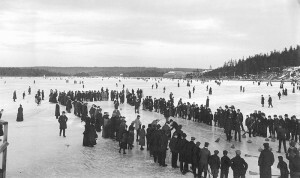 The originally outdoor sport of curling, that required long sheets of ice and cool weather, was a perfect fit for a Canadian climate. Hockey tends to get a lot of the attention as a winter sport, that is deeply connected to identity in Canada, but curling has played a significant role in shaping community and national identities in this country. The Canadian Curling Association statistics from 2011 indicate that approximately 653,000 people curl across Canada. Curling clubs are typically designed so that curling can be watched from a separate area that facilities socializing. These spaces often include tables, a bar, and a TV or two. In many towns these spectator spaces are used by curlers and non-curlers alike for community functions like dances, weddings, fundraisers, etc. Curling clubs have a history of being intertwined with community life and a sense of community pride. Many clubs operate exclusively on volunteer labor, perhaps with a single paid ice-maker. The social value of volunteerism and community are still evident in the operation of curling clubs today, with members organizing events, tending the bar, cleaning, and managing the club on a volunteer basis. The link of curling to community life is also clearly seen when looking at curling bonspiels. For the unfamiliar, a bonspiel is essentially a curling tournament. Bonspiels often also include numerous social activities such as banquets, dances, and team challenges. Bonspiel events often encourage community pride, bring families back to their home community, and create a friendly rivalry between neighbouring towns. Overall, bonspiels just tend to be good fun and bring people together to curl and connect. The very nature of curling promotes camaraderie and socialization. Traditionally games start with a coin toss and with players wishing the opposing team ‘good curling.’ Opposing players often congratulate each other on difficult shots and a feeling of respect is maintained throughout the game. At the conclusion of a game the winners typically offer to buy the losing team a drink from the bar and the two teams sit together and talk about the game, curling, and anything else that interests them. Having post-game socialization built into the customs of curling make this a sport that encourages the development of camaraderie and a sense of community. The politeness and sportsmanship has also been called by some as quintessentially Canadian in attitude. 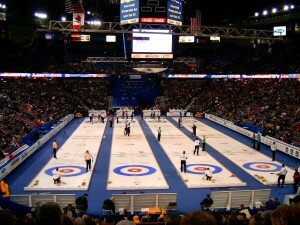 Tim Hortons Brier, Edmonton, Alberta, Canada, 2005. Public Domain. Curling has gained popularity on an international scale with professional, commercial and Olympic competitions being broadcast on TV. However, even within these high level contests curlers are seen as everyday people and as having a connection to their local community clubs. Most professional curlers have a day job, if you watch the Brier or Tournament of Hearts they will often show information about the curlers hometown and their jobs outside of curling. The most well known example of this is the fact that curling champion Glenn Howard works at a Beer Store near Midland, Ontario. Even on a national or international level curling is tied back to the community level and the players are seen as average people, presenting the idea that anyone can be a curling champion with work and dedication. Tonight marks the first night of league play at my local curling club. Growing up in Southern Ontario I was aware of curling as events were often hosted in the local curling rink, and I regularly watched curling with my Dad, but I had never actually stepped on to the curling ice. This changed when I moved to a small town in Northern Ontario where I curled in my first bonspiel, enjoyed many a wing night at the local curling club, and this year I am curling in a league. Curling clubs across Canada are meeting places and community spaces. Curling brings people together, inspires Canadian ideals, and is deeply rooted in the history of Canada. Thank you for the great post on curling in Canada. It has been forwarded to Mississaugua GCC Curling Pro, Ice Maker & Asst. Manager, Club executive and Curling Captains! A great review of the sport. Thank you. Good Curling! Thank you Terry Lee for your kind comment and for sharing the post.